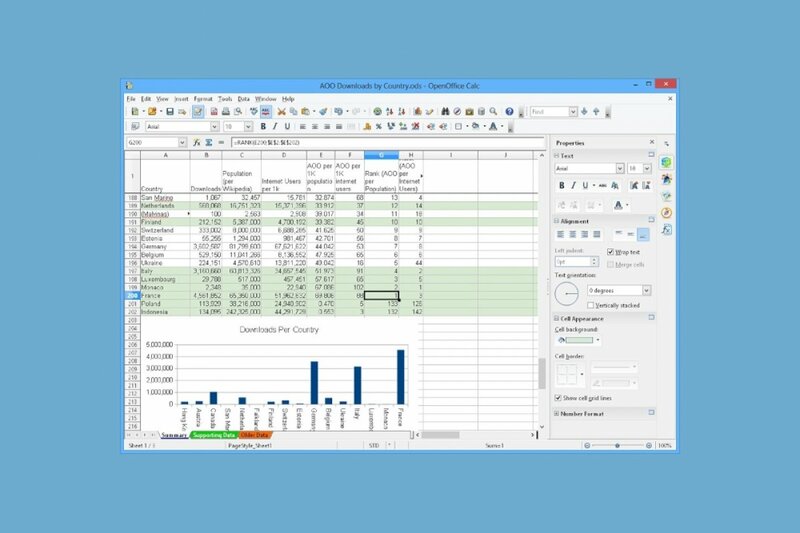 Just like the rest of programs that are part of Apache’s suite, it’s a free and open-source application, and it stands out for its compatibility with Microsoft Office’s equivalent tool, in this case, Microsoft Excel. Export spreadsheets to PDF format. Function to create groups of dynamic tables to simplify the use of raw data, cross-checking them and summarizing them to turn them into significant information. Loads of configuration options (pages, buttons, toolbars, language options…). Creation of formulas using natural language words that simplify our interaction with the program. Function to create simulations with the scenarios option that allows us to obtain data forecasts if we pose different contexts. Documents protected with a password. Multiuser support that encourages collaborative work on spreadsheets sharing our work with other users. Sort the data according to the selected criteria. Support for symbols, formulas, diagrams, hyperlinks, bookmarks, and forms. One of the greatest advantages of Calc regarding Microsoft Excel is, as we mentioned above, its open-source nature. That basically means that anyone can contribute improving and updating the application with enhancements that can later be enjoyed by the rest of the user community.